Happy Monday! I wanted to start the week off with a fun, light, short and sweet kind of read! Take a well-deserved three minute break from whatever you are doing and come with me to Praha (Prague). Before arriving to picturesque Prague, I had formed ideas of what I might find in the “City of One Hundred Spires.” However, I was completely shocked by the Czech’s sense of humor (I’ll elaborate in a future post) – even in the restroom! While shopping at the Palladium Mall in downtown Prague, my husband and I stopped for a restroom break. When he came out of the men’s restroom, he had a huge smirk on his face. Obviously, I was curious to know what happened, but instead of explaining, he just took out his camera to show me. 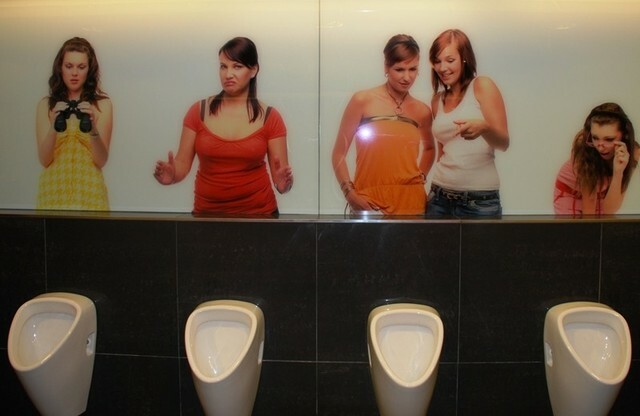 Get this — above each urinal, is a picture of a girl with a facial expression in regards to what she sees. Choose wisely, men. Who knew you would have so many options in a restroom! … And I think have a feeling I know which urinals tend to be the most used (wink, wink)!